There are actually two shots of snow on the way for New Jersey. 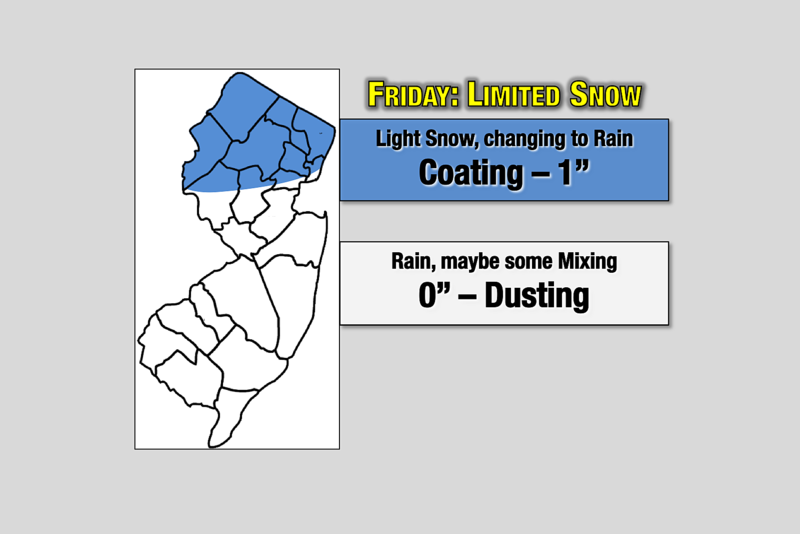 Friday's snow event will be very minor, with only limited wintry impacts. This will be a snow-to-rain event. And, with temperatures in the 40s in South Jersey Friday morning, it may be all rain for a good part of the state. Flakes and drops should spread north and east through all of New Jersey by 8 a.m. Meanwhile, rising temperatures will enact a change from some snow to all rain. Precipitation should largely exit the Garden State around Noon Friday, although lingering rain showers are probable in North Jersey through the afternoon. Accumulation? Maybe a healthy coating for North Jersey — to be safe, I'll say up to an inch is possible on colder, grassy surfaces north of Interstate 78 or so. South of that, a trace of slush is possible. Overall, do not expect much wintry stuff on Friday — the worst part about this mini-storm is the timing, coinciding with the morning commute. Breaks of sun are possible Friday afternoon, as a gusty wind picks up to 35+ mph. High temperatures should spike into the lower to mid 50s to North Jersey, near 60 degrees in Central Jersey, and lower to mid 60s in South Jersey. Yes, that means Friday's forecast spans the gamut from snow to sixties! Saturday's storm will work in the reverse direction as Friday's — a cold front will force temperatures downward enacting a change from rain to snow. The biggest burst of wintry weather will come from a low pressure system riding along that frontal boundary, which actually looks more like Saturday evening. The timing of that band, the exact orientation of the front, and the temperature/precipitation type when it arrives will make or break this forecast. It's a delicate balance between the coldest temperatures (north) and the heaviest snow (south). So Saturday will start wet, with a band of mostly rain associated with the cold frontal passage. Lingering showers will be possible through the afternoon hours. Then, if the aforementioned low travels close enough to the Jersey Shore, we'll have one more round of snow clip South Jersey around Saturday evening. That's when accumulations could occur. Overall, this system does not have the makings of a major winter storm. Unlike the past few late-season storms, the track and dynamics are just off this time around. The convective potential will be limited — which means snow shouldn't "pour from the sky". In addition, the questionable temperature profile of the air and ground comes into play when considering and calculating potential snow totals. I've settled on a snow forecast of 1 to 3 inches for southern New Jersey, primarily on grassy and other non-paved surfaces. (Even that may be overdoing it, given the latest off-shore GFS and European model runs.) Further north, I'm leaving a coating of snow accumulation in the forecast, but again even that may be too high. It's a weekend storm, so we have no school delays or closings to worry about, nor a morning/evening "commute" per se. However, I think it's important to stress that no matter how much snow accumulates on the grass or on the road near you, driving conditions may be sloppy at some point on Saturday. Hopefully, the NJDOT will keep ahead of this storm by pre-salting and brining the roads. With temperatures close to the freezing mark for the duration, and only light to moderate snowfall, it shouldn't be that hard to keep major roads relatively passable. Sunday will clearly be the quieter weather day of the weekend. The day will start with sunshine, becoming partly sunny through the afternoon. It will be breezy and cool, with high temps limited to the mid to upper 40s. There's one more storm system (barely) worth watching, in the Monday-Tuesday time frame. I've called this one "nor'easter-ish" — it's a coastal storm, although we're probably not going to suffer an extended period of traditional northeasterly ("nor'east") winds. 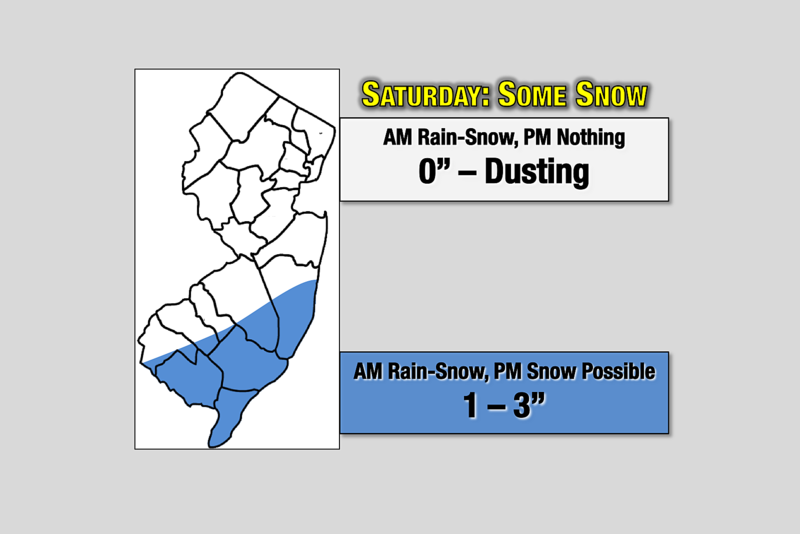 The latest models show mostly/all rain, perhaps with a period of snow in North Jersey. I still believe we have to watch the coast for minor surf and surge issues as well. Too early for details. I'm not really going to focus on the Monday-Tuesday storm until Saturday is done. It does look like once we get past this system — currently the third in the storm pipeline — the sustained springtime warmup will finally begin! 50s next Tuesday, 60s next Thursday, 70s next Saturday? I can't wait!